Anyone who has spent a fair amount of time studying the manuscript evidence for the Quran is aware that a large part of the Quran was lost even before the full text could be collected and written down. The Islamic sources themselves testify that substantial portions of the "revealed verses" never made it into the Quran compiled by Caliph Uthman years after the death of Islam's prophet, Muhammad. The Jewish and Christian Scriptures, on the other hand, do not have any books missing at all. 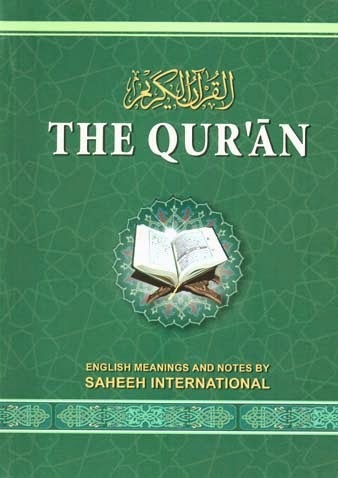 But perhaps to try and portray the Old and New Testaments as having similar problems, the Saudis appear to have purposely mistranslated their English translation of at least one verse of the Quran which is known as the Sahih International version. Pickthall "Those who follow the messenger, the Prophet who can neither read nor write, whom they will find described in the Torah and the Gospel (which are) with them. He will enjoin on them that which is right and forbid them that which is wrong. He will make lawful for them all good things and prohibit for them only the foul; and he will relieve them of their burden and the fetters that they used to wear. Then those who believe in him, and honour him, and help him, and follow the light which is sent down with him: they are the successful." Yusuf Ali "Those who follow the apostle, the unlettered Prophet, whom they find mentioned in their own (scriptures), - in the law and the Gospel; - for he commands them what is just and forbids them what is evil; he allows them as lawful what is good (and pure) and prohibits them from what is bad (and impure); He releases them from their heavy burdens and from the yokes that are upon them. So it is those who believe in him, honour him, help him, and follow the light which is sent down with him, - it is they who will prosper." Hilali-Khan "Those who follow the Messenger, the Prophet who can neither read nor write (i.e.Muhammad SAW) whom they find written with them in the Taurat (Torah) (Deut, xviii, 15) and the Injeel (Gospel) (John xiv, 16) - he commands them for Al-Ma'ruf (i.e. Islamic Monotheism and all that Islam has ordained); and forbids them from Al-Munkar (i.e. disbelief, polytheism of all kinds, and all that Islam has forbidden); he allows them as lawful At-Taiyibat [(i.e. all good and lawful) as regards things, deeds, beliefs, persons, foods, etc. ], and prohibits them as unlawful Al-Khaba'ith (i.e. all evil and unlawful as regards things, deeds, beliefs, persons, foods, etc. ), he releases them from their heavy burdens (of Allah's Covenant), and from the fetters (bindings) that were upon them. So those who believe in him (Muhammad SAW), honour him, help him, and follow the light (the Qur’an) which has been sent down with him, it is they who will be successful." Shakir "Those who follow the Apostle-Prophet, the Ummi, whom they find written down with them in the Taurat and the Injeel (who) enjoins them good and forbids them evil, and makes lawful to them the good things and makes unlawful to them impure things, and removes from them their burden and the shackles which were upon them; so (as for) those who believe in him and honor him and help him, and follow the light which has been sent down with him, these it is that are the successful." Sher Ali "Those who follow the Messenger, the Prophet, the Ummi whom they find mentioned in the Torah and the Gospel which are with them. He enjoins on them good and forbids them evil and makes lawful for them the good things and forbids them the bad things and remove from them their burdens and shackles that were upon them. So those who shall believe in him and honour and support him and help him and follow the light that has been sent down with him - these shall prosper." Arberry "those who follow the Messenger, 'the Prophet of the common folk, whom they find written down with them in the Torah and the Gospel, bidding them to honour, and forbidding them dishonour, making lawful for them the good things and making unlawful for them the corrupt things, and relieving them of their loads, and the fetters that were upon them. Those who believe in him and succour him and help him, and follow the light that has been sent down with him — they are the prosperers." Sale "who shall follow the apostle, the illiterate prophet, whom they shall find written down with them in the law and the gospel: He will command them that which is just, and will forbid them what which is evil; and will allow unto them as lawful the good things [which were before forbidden], and will prohibit those which are bad; and he will ease them of their heavy burthen, and of the yokes which were upon them. And those who believe on him, and honour him, and assist him, and follow the light, which hath been sent down with him, [shall be] happy." those who follow the Messenger, the uninstructed Prophet, Muhammad (s) whom they will find inscribed in their Torah and Gospel, in name and description, enjoining them to decency and forbidding them indecency, making lawful for them the good things, which were forbidden [to them] by their Law, and making unlawful for them the vile things, such as carrion and the like, and relieving them of their burden, their onus, and the shackles, the hardships, that they used to bear, such as [the requirement] to kill oneself as a repentance and the severing of that part that had come into contact with any impurity. Then those who believe in him, from among them, and honour, revere, him, and help him, and follow the light that has been revealed with him, namely, the Qur’ān, they are the ones who will prosper’. (Those who follow the messenger) the religion of the Messenger, (the Prophet who can neither read nor write) i.e. Muhammad (pbuh) (whom they will find) with his traits and description (described in the Torah and the Gospel (which are) with them. He will enjoin on them that which is right) Allah's divine Oneness and moral excellence (and forbid them that which is wrong) disbelief and hurting others. (He will make lawful for them all good things) he explains to them the lawfulness of that which is in the Scripture such as the meat and milk of camels, sheep and others (and prohibit for them only the foul) he explains to them the unlawfulness of what is in the Scripture such as carrion, the meat of swine and other things; (and he will relieve them of their burden) their pledges the breaking of which made good things unlawful for them (and the fetters) the hardships (that they used to wear) such as tearing up their clothes and other things. (Then those who believe in him) in Muhammad (pbuh) i.e. 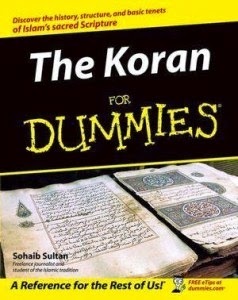 'Abdullah Ibn Salam and his followers, (and honour him) and assist him (and help him) with the sword, (and follow the light) the Qur'an (which is sent down with him) which was sent with Gabriel: that which is lawful, they declared lawful, and that which unlawful, they declared unlawful: (they are the successful) who are saved from Allah's wrath and torment. One is left to wonder... why would the Saudis depart from the (presumed) goal of delivering the most accurate possible translation of the Quran? Could they perhaps be attempting to provide support for their explanation as to why Muhammad is not found in the Jewish and Christian Bible, as he had told them he would be? And if these Islamic scholars saw no problems with changing the words of Allah in this ayah, how much more of "The Noble Quran" should be considered suspect?